Japan's new Prime Minister Naoto Kan has called for good governance in Afghanistan to make sure that Japanese aid money is used effectively. He made the comments during a meeting with Afghan President Hamid Karzai, who is on a visit to Japan. Japan - one of Kabul's biggest donors - last year pledged $5bn in aid for Afghanistan over five years. Mr Karzai promised Mr Kan the aid would be used for the development and stability of Afghanistan. Earlier, the Afghan leader met Japanese Emporer Akihito. He is also due to speak at a seminar and visit the Hiroshima Peace Memorial for the victims of the US atomic bombing before leaving Japan on Sunday. 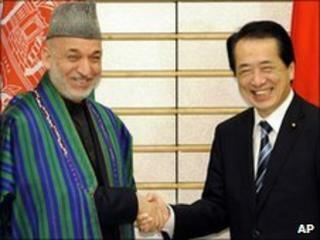 Mr Karzai is the first foreign leader to meet Mr Kan since he took office earlier this month. During talks between the two leaders, Mr Kan "requested firm efforts, including those for good governance, in order to have tax of Japanese nationals effectively utilised", a joint statement said. At a joint press conference, Mr Karzai told him "the Afghan people would do their best to have this money spent in Afghanistan for the best purposes of developing and stability in Afghanistan". During his trip, President Karzai is also expected to ask for support for his plan to lure Taliban fighters from the battlefield with jobs and economic opportunities, the BBC's Roland Buerk in Tokyo says. Japanese money has already been used to build roads, a new airport terminal in Kabul, and to pay the wages of the Afghan police force. The $5bn offered last year was made on condition that the money would not be lost to corruption. Japan has never deployed troops to Afghanistan, but its Maritime Self-Defence Force did operate in the Indian Ocean providing fuel and water to international forces. The mission was ended after the new centre-left Government came to power in Japan last year saying it wanted to offer more civilian aid instead.